This theory is meant only to apply to disease outbreak/epidemic/pandemic situations, and then only to those which include fatal cases. This theory of mine has only emerged since I've been plotting Ebola virus cases numbers from the West African epidemic. I precede the explanation with the caveat that there is very probably already a well developed, well-known actual epidemiology term to describe this theory. But I'm not a trained epidemiologist and this is just a blog, so please forgive me my ignorance. The theory goes that when a gap grows between the number of new cases being reported and the number of deaths or laboratory confirmations in that population, despite the outbreak having been going for a while, this represents an indication that control of the situation is slipping, or has been lost. This "control gap" - my term, so don't expect to find it anywhere official or that knows of that which it speaks - can also appear when looking at suspected or probable cases of disease X, and the number of those that have been confirmed by a laboratory test. Other explanations for the control gap may exist of course; testing may be scaled back deliberately, reporting of deaths may have been deliberately throttled for some political reason. So it may not reflect being "out of control" as much as someone else being "in control". Probably still more variations that I have not thought of at all. Ebola virus disease (EVD) in Liberia. In the graphics below I've used the accumulation of World Health Organization data for Liberia, up to 23-Sept.
First up - the fold increase in total case numbers (suspect+probable+laboratory confirmed) compared to the fold-increase in the distance between that total and the total number of laboratory confirmed cases alone. This distance, or the "control gap|lab", has widened over time. It has widened because total cases have climbed more steeply than the number given a laboratory confirmed diagnosis of EVD. For whatever reason(s), laboratory confirmations are not keeping pace with the total case numbers, and they seemed to start slipping at the end of July. I suspect a principal reason - and I'm not on the ground of course, so this is all speculation and second-hand knowledge - is that laboratory capacity is overwhelmed. Other reasons include that samples might not always be collected or that many recent clinically defined EVD cases are actually due to something clinically similar to EVD, but not an Ebola virus infection. If it were this last one though, the total numbers would be readjusted downwards as new diagnoses were made...if the laboratory has time to make those of course...so I doubt it as a major role. A.) 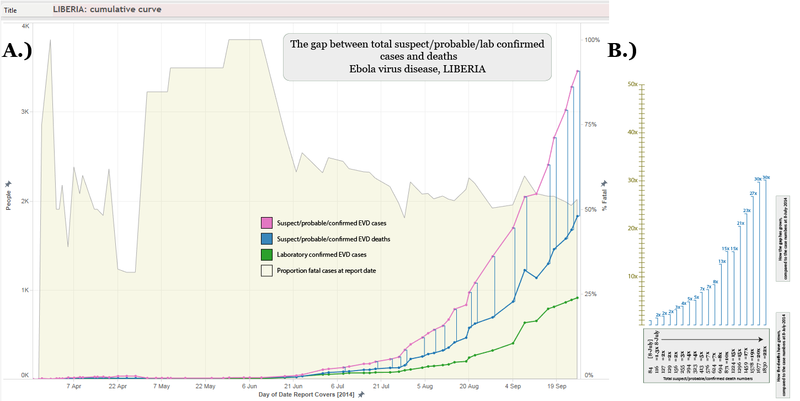 Ebola virus disease case graph for Liberia showing the accumulation of total (suspect+probable+laboratory confirmed) cases (pink line; left y-axis) and deaths (blue line; left y-axis), the laboratory confirmations (green line; left y-axis) and the proportion of fatal cases (right y-axis) at each reporting date (x-axis). The size of the gap between laboratory confirmed cases and total cases is indicated for a range of reporting dates, using a vertical green drop-line. B.) The drop-lines have been copied and aligned and the amount they have grown has been measured using a scale bar so that the fold-increase can be compared to the first reporting date used, 8-July. The fold-increase value is written at the top of each drop-line. Along the bottom (enclosed within a grey box) are the case numbers at each reporting date examined and the fold-increase (in bold) compared to the 8-July baseline. Next up -the fold increase in total case numbers (suspect+probable+laboratory confirmed) compared to the fold-increase in the distance between that total and the total number of deaths. The control gap|deaths comparison finds that the deaths and the total cases don't diverge as much as total cases and lab confirmations do. A.) 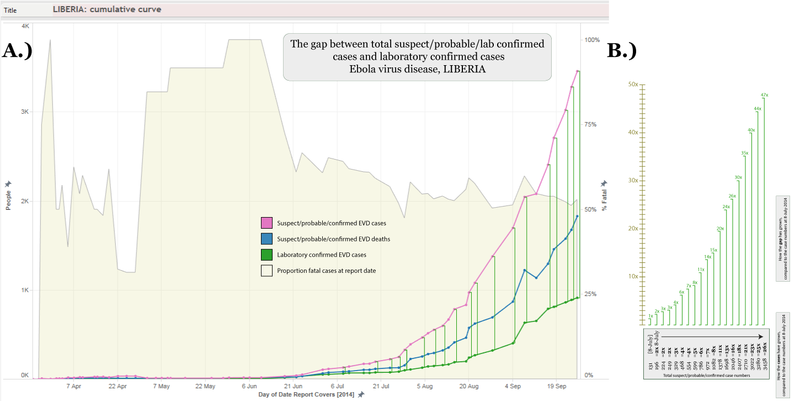 Ebola virus disease case graph for Liberia showing the accumulation of total (suspect+probable+laboratory confirmed) cases (pink line; left y-axis) and deaths (blue line; left y-axis), the laboratory confirmations (green line; left y-axis) and the proportion of fatal cases (right y-axis) at each reporting date (x-axis). The size of the gap between laboratory confirmed cases and deaths is indicated for a range of reporting dates, using a vertical blue drop-line. B.) The drop-lines have been copied and aligned and the amount they have grown has been measured using a scale bar so that the fold-increase can be compared to the first reporting date used, 8-July. The fold-increase value is written at the top of each drop-line. Along the bottom (enclosed within a grey box) are the number of deaths at each reporting date examined and the fold-increase (in bold) compared to the 8-July baseline. So with that visualization under our belt, there is another, less laborious way to look at this, by graphing the numbers, rather than the gaps. What we see when we plot the fold-change values against report date is that total cases lost control as we suspected, but deaths are less obviously out of control. From 9-Sept onwards the gap has widened a little more consistently. Before that though the deaths did not dramatically drift away from the rate at which new cases were being added. I'll graph Sierra Leone, Guinea and Nigeria in the next day or two. Nigeria should serve as an example of how this looks for a country in which EVD is definitely in control.